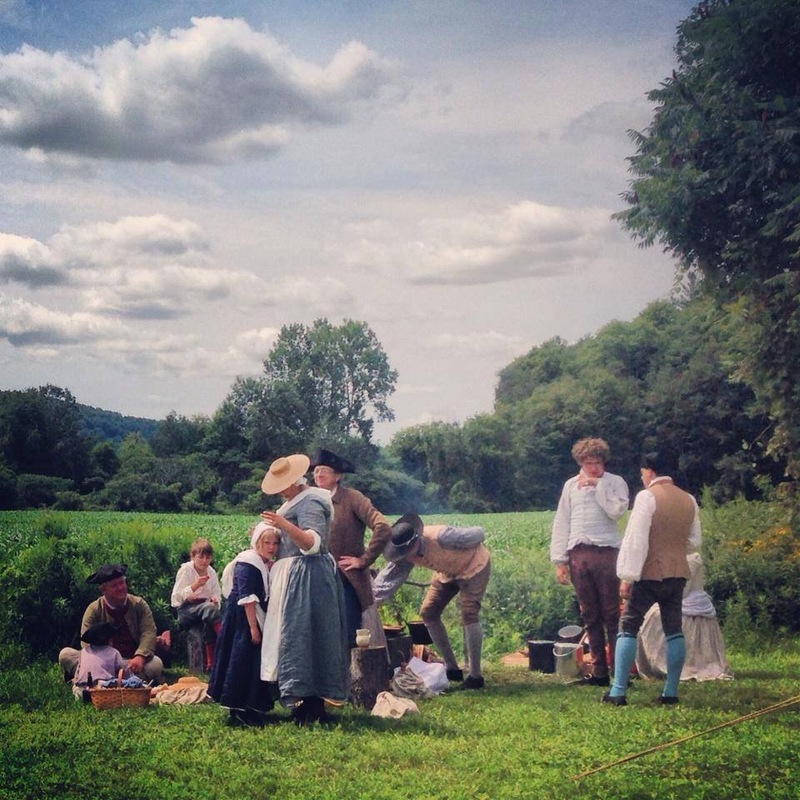 In the post-What Cheer Day aftermath, when I was very tired and two houses were very messed up, I started thinking about why I bothered with living history. What exactly is this thing, and why I do it? Those questions made me think about the very best moments I have had in this business of re-creating the past in cloth and smoke and time. 1. 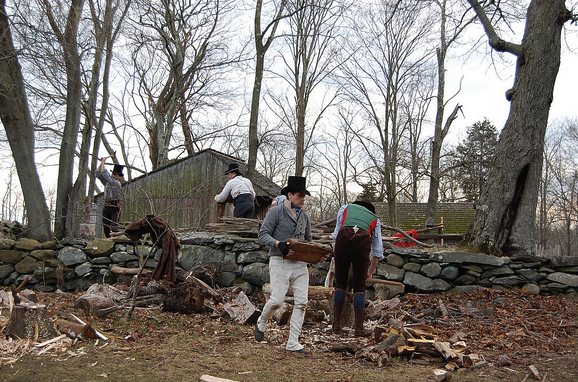 Going up to the field at Coggeshall Farm to call the boys down to dinner after spending all day in the kitchen. I was desperate to get out, and finally knew first hand how limited women’s lives could be in the 18th century, especially non-elite women. 2. 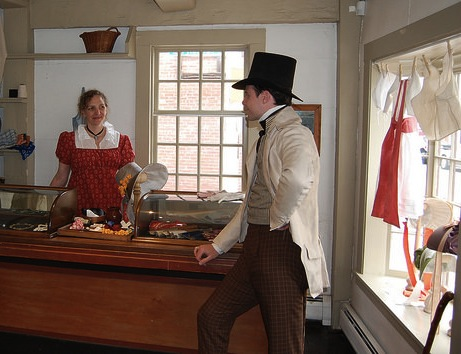 Running upstairs at the John Brown House with Eliza, giggling over a joke to be played on Mr Mason. I don’t know what Mr C thought of it but I felt twelve years old, silly, carefree and light. John Brown’s housekeeper surely never felt that way, but a naughty maid might have, and for an instant I knew what it was to have no responsibilities. 3. 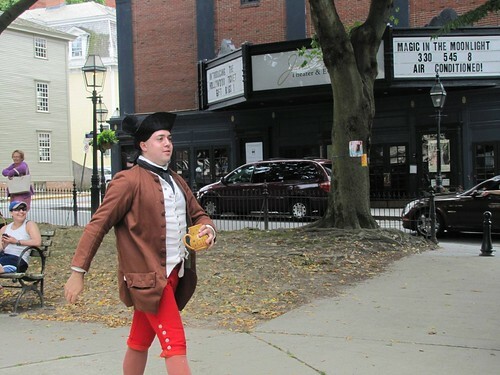 Chasing the Young Mr, a wayward apprentice, across the street; mobbing Mr Howard’s house; and arguing with the Stamp Inspector, all during the Stamp Act Protest in Newport It was not until I looked at the photos that I realized we really had been in front of a theatre, and that there were actual cars! A friend confirms that he, too, forgot about the cars, to the point of nearly being hit whilst running to Mr Howard’s house. 4. Assembling with a group of friends to take tea with Mrs Silsbee in Salem, sorting ourselves into a group on the sidewalk and venturing out, only to meet Mrs Silsbee on the street. That is the most Jane Austen/Mrs Gaskell I have ever felt. The wretched cobblestones do not count, as they were from the 20th century, but walking out on the wharf, and meeting a friend who brought an umbrella as the rain began was also very Austen-esque. None of these are military events, and the majority of them happened this year, in past three months. I think this may be because we have been to fewer military events, and I expect the concentration is due, in part, to finally getting better at this practice. They are also site-specific, and trending toward first-person interpretation. For reasons explained better by the NPS and in the excellent study of NPS-Reenactor relationships, no battle reenactment can ever capture the truth of the war it attempts to recreate, and that is true even when the battle takes place on the same site, at the same time of year, and even when soldiers are dressed in as-close-as-possible replicas of the uniforms worn at that battle, on that field, on that date, 236 years earlier, and no one has brought a spinning wheel or tent chandelier to camp. 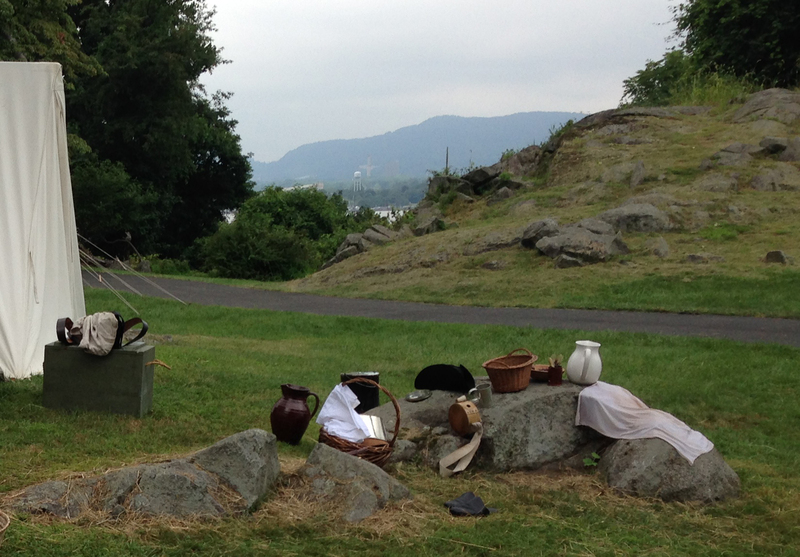 I respect the notions of moveable monuments and performances as commemoration. I like military history, I like war memorials: there is not a competition between civilian and military reenactments. But military events have not yet had the power to transcend experience for me. My best guess as to why military events are not transformative for me is that, to this point, the business remains too much like camping in funny clothes. 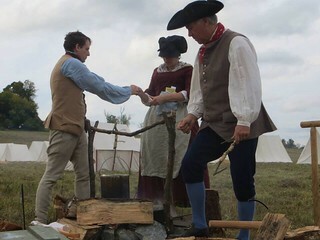 As I experiment more with 18th century methods of cooking appropriate rations, and as I strip away the gear we carry into the field, the military events are better (as at Bennington). But I already know how limited women’s perspectives could be (see item 1), and while Bennington was instructive in how ridiculously different the experiences of men and women could be, the military events remain more instructive experiences for the men. Why? Because the specificity of site plays out at those events in the battle, and not in the camp. The point at Bennington and at Saratoga and at Stony Point was to use the site as it had been used. 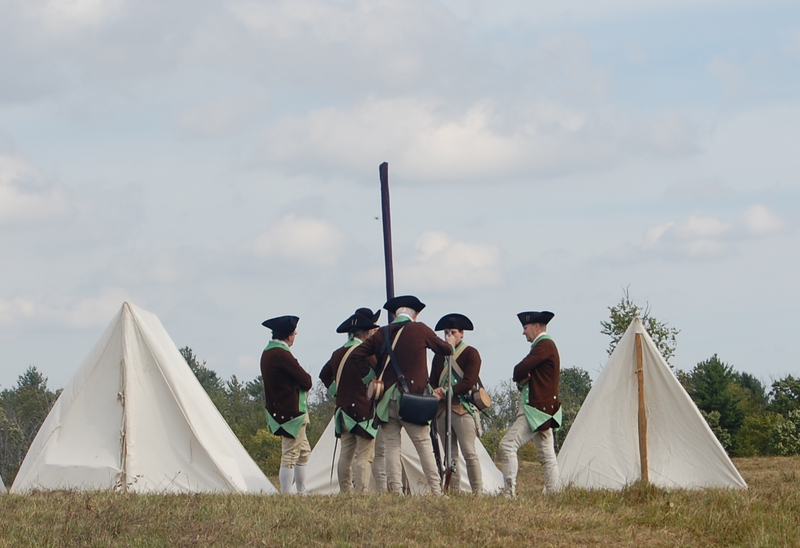 The men experienced the landscape in ways as close as possible to what soldiers and militia had actually seen. And women stayed in camp and got smoke in their eyes, cut up vegetables, or washed clothes, which is pretty much what happens at any outdoor event where we can have a fire and, with differences in technology, is pretty much what I do when I get home from work every day. All that leaves me wondering what to make of military events, and what I want to do in the coming year. No matter how much of this is “for the public,” it still has to be rewarding for the practitioner.